As seems to be the case lately, I started this article with the intent to write about my ancestor William Sanderson of Watertown and now I find myself writing about a man, Robert Sanderson, who may or may not be his father. The genealogy search is like following the proverbial “white rabbit” and eventually it leads me down the rabbit hole. I think I am headed in one direction and find myself after awhile somewhere I don’t recognize. That’s what I think I love about doing this research, it’s like an addictive game. Most of the time I want to pull my hair out, but when the pieces all fall together I feel like I’ve won a battle. My opponents in this game are varied, time and distance from my ancestors of course, but more frequently it is other genealogy fans who, like me, post “stuff” on the internet. The tough part it trying to figure out if their “stuff” is legit or not. So here is some of the “stuff” I have found either in books, vital records, or on the internet, about Robert Sanderson of England, Hampton NH, Watertown and Boston. "That I Robert Sanderson the sonne of Saundersonne of Higham doe put myselfe apprentize until William Rawlins Citizen & Goldsmith of London for the terme of nyne yeares." Unfortunately there are several small towns in England called Higham. Many ancestry trees and other internet sites claim that Robert was the son of Edward Saunderson and Isabella Shiercliffe of Sheffield, Yorkshire, England. This is not correct. Isabella Shiercliffe of Holehouse, buried at Sheffield Jan. 2, 1613; married at Sheffield Aug. 7, 1598, Edward Saunderson of Sheffield and Grimesthorpe, bapt. at Sheffield Jan. 15, 1576/7, will dated Apr. 21, 1617, buried at Sheffield Apr. 24, 1617, only son of Nicholas Saunderson and Margaret (Rawson). — Nicholas Saunderson of Sheffield, gent., eldest son and heir, bapt. at Sheffield Aug. 3, 1600, married a daughter of Norton of Sandal-Magna, gent. — Edward Saunderson of Sheffield, gent., second son, bapt. at Sheffield Aug. 17, 1602, will dated May 2, 1670, buried at Sheffield Feb. 19, 1673, married Anne, daughter of Francis Barlow of Sheffield. 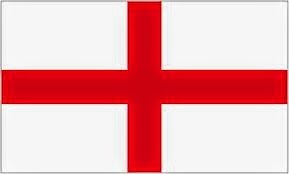 I have seen genealogies where they have blithely ignored the fact that Edward the son was born, married and died in England and made him into the Edward Sanderson who immigrated to the Bay Colony. Then they stuck Robert on as a third son and voila family complete. As far as I can tell, the parents of Robert are unknown. "three pieces are known from that period - an unlocated salver and two communion cups and patens. This form of communion cup with its flared body and large trumpet foot follows the chalice-like form revived by William Laud, Archbishop of Canterbury during the 1630s. This form along with the use of the "IHS" on this cup was exactly the kind of vaguely Roman Catholic symbolism that infuriated the English Puritans and provoked a deep suspicion of the actual religious beliefs of King Charles I and Archbishop Laud. Probably having converted to Puritanism at an early age, Sanderson's dissatisfaction with having to make such forms may explain his decision to leave for Puritan New England. A number of American silver authorities had questioned if the London and Boston John Sanderson were the same man; however, tests confirmed that the the marks on his London and Boston pieces were struck with the same die." Robert was apprenticed in 1623, he finished in 1632 and was made a Freeman of the Guild of Goldsmiths. In 1634 William Rawlins, his old master, apprentice his own son William Jr. to Robert Saunderson. The apprenticeship would have been for nine years, however the apprenticeship was transferred to another Goldsmith, George Dixon, presumably when Robert was preparing to immigrate to New England. In 1642 William Rawlins Jr. completed his apprenticeship. (www.londonroll.org) William Rawlins Sr. lived and presumably worked, on Sherborne Lane in the parish of St. Mary Woolnoth. He worked as a goldsmith from 1607 until his death 1637. The baptisms of his children are recorded in the St. Mary Woolnoth parish records. In 1640 and 1651 men named Saunderson from a small village called Pilton were apprenticed to Goldsmiths in London. Pilton is only twelve miles from Higham, believed by some to be the origin of Robert Sanderson. Are they related, cousins maybe? marriage and children What does a master goldsmith need? A wife of course. I don't think that men were able to marry during their apprenticeship so Robert would most likely have married in 1632 after he finished and established his own business. In the parish records of St. Mary Abchurch are found the baptismal records of Robert and Lydia Saunderson. On 26 Feb 1633 Robert was baptized and his sister Lydia on 21 Jan 1635. In the book, The Inhabitants of London 1638, a Mr. Sanderson lives in the parish of St. Mary Abchurch. This sounds like our family. Robert left England and arrived in New Hampshire in 1639. He was not a passenger on the ship “The Increase” in 1635 and neither was Edward Sanderson, nor John and Mary Cross. 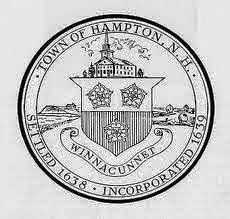 The little we know about his life at this time is from the records of Hampton, NH. According to Dow in his history of Hampton, Robert received 80 acres of land, including a house lot in December of 1639. He later sold this lot to Francis Swaine and moved to Watertown, MA by 1642. Dow also records the baptism of a daughter Mary on 29 Oct 1639. the mothers name is recorded as Lydia. At some time after the birth of his daughter Mary, which was probably in October of 1639, Robert’s wife Lydia died. Her death is said to have occurred in Hampton, but it was not recorded. According to Torrey and other sources Robert then married a widow named Mary Cross. Their first child was born on 1 January 1643 in Watertown. Subtracting nine months from this date gives a marriage date of no later than March of 1642, both Cutter and Bond in their histories say the marriage occurred in 1642. Torrey says that Robert married by 1643. But who was the widow Mary Cross. She was not the widow of John Cross who was in Hampton, NH at the same time as Robert Sanderson. That John arrived in 1634 on the “Elizabeth” with his wife Hannah. He lived in Hampton briefly but removed to Ipswich. He died in 1650. According to his bio in the Great Migration series by Robert Charles Anderson, he had only one child, a daughter Hannah who later married Thomas Hammond. All we know was that he was John Cross of Watertown and that he died Sept 15, 1640. Mary subsequently gave birth to a daughter Mary on May 10, 1641. Mary was buried in the Granary Burying Grounds. According to her headstone she died June 21 1681 aged 74 and her grandson in the grave with her. Robert Sanderson and his family settled in Watertown. In addition to son Joseph, Robert and Mary had Benjamin (1649), Sarah (1651) and Robert (1652). Presumably Robert was working as a silversmith at this time, but very little is written about his life in Watertown. In 1652 he moved his family again, this time settling in Boston. On August 19, 1652 Robert took his oath as an Officer of the Mint. The colony of Massachusetts was about to begin producing it’s own coins and Robert Sanderson and his partner John Hull of Boston were the silversmiths chosen for the job. By mid October the new coins were in circulation. In addition to making coins the men produced silver pieces for Churches and other customers, many of these pieces survive today. The first two apprentices taken on by this new partnership were the two oldest sons of Robert, John and Joseph. In 1658 John Hull recorded in his diary the death of his apprentice John Sanderson of some type of fever. He also notes that Robert Sanderson and his son Joseph also suffered from the same fever but recovered. Robert was active in the church, becoming a deacon of the First Church of Boston. He together with the Rev. John Oxenbridge, John Hull, his partner, and others established the first (gun) powder mill in Massachusetts in about 1675. A pair of silver cups made by John Hull and Robert Sanderson were estimated by Sotheby's for 300,000 to 500,000 dollars. Wow! In 1681, only months after the death of his second wife Mary, Robert Sanderson was preparing to marry for the third time. He created a deed which would ensure that his new wife, Elizabeth, would be taken care of after his death. He gave her his “mansion house”, two orchards, other land in Boston, half of his household goods and furniture and 50 pounds in money or silver plate. He said she could have whatever of his books she wanted. He also said she would have all of the rents of his tenements and houses in Boston. Obviously, Robert was fairly well off. In return Elizabeth agreed to take care of his daughter Abigail, who was incapable of caring for herself. Abigail’s birth is not recorded. Mary Sanderson b. 29 Oct 1639 Hampton, NH. John Sanderson b. unknown, d. 18 Sep 1658 of a fever. His brother Joseph was also sick but he recovered. John was unmarried and was an apprentice at the time of his death. 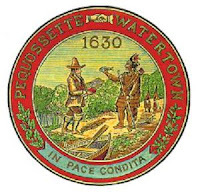 Joseph Sanderson Second or third son of Robert, his birth was recorded in the Watertown records as 1 Jan 1641/2. He began his apprenticeship in 1658 with his brother John. He became a silversmith on the completion of his apprenticeship and worked until his early death in 1666 at age 23. Joseph married Mary Unknown and had two daughters Abiah and Mary. His widow remarried to William Ardell in Boston. A trust deed was established to protect Mary’s rights to her property. Robert Sanderson and his wife Elizabeth gave land and houses to the Ardells. Benjamin Sanderson Benjamin, born 1649, followed his brothers in an apprenticeship in his fathers business. He served as an apprentice from 1663 until 1670. He married Mercy Viall about 1672 and his son Benjamin Jr. was born on May 25th 1674. He was dead by December of 1678 only 30 years old. None of his children apparently survived. Abigail Sanderson birth not recorded. Elizabeth third wife of Robert agreed to take care of Abigail who could not care for herself. Sarah Sanderson b. 1651 Watertown. Sarah married Robert Darby of Boston. Her son is name in her fathers will. She too died before her father. Robert was the only son to survive his father. He too was an apprentice in the business and in fact took over the silversmith business after the death of his father. He is named in his father’s will. Married James Penniman, their children were named in Robert Sanderson's will. "England Births and Christenings, 1538-1975," index, FamilySearch (https://familysearch.org/ark:/61903/1:1:JWQ5-BMB : accessed 4 May 2015), Lydia Saunderson, 21 Jan 1635; citing SAINT MARY ABCHURCH,LONDON,LONDON,ENGLAND, reference ; FHL microfilm 374,483. The Transcript of the Registers of the United Parishes of S. Mary Woolnoth ...By London(England). St. Mary Wollnoth with St. Mary Woolchurch (Parish), Jame Mark Saurin Brooke, Arthur Washington, Cornelius Hammen. Comments, Challenges, Polite Criticisms Welcome, Proof Required!